If you’re a boater, chances are you tune in to Ship Shape TV every week to check out the latest and greatest project that John Greviskis is working on. John Greviskis is a man with a vision for television and a passion for boating. 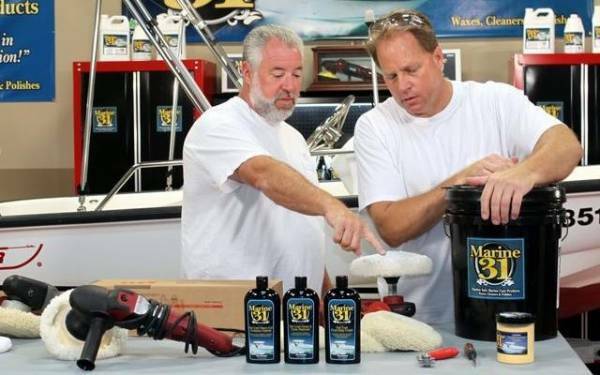 Mike Phillips and Marine 31 have teamed up with John Greviskis and the Ship Shape TV crew to offer in-depth segments on proper boat care and maintenance, including boat oxidation removal, boat vinyl cleaning and protecting, how to clean non-skid on boats, and boat metal polishing and protecting. If you saw a Marine 31 segment on Ship Shape TV, and can’t quite remember the name of the featured product or tool, you’ll find everything on this page. If you still can’t find what you’re looking for, don’t hesitate to give us a call! 1-877-797-8803. I’ve been watching Ship Shape TV since before John’s hair was gray, and I can’t tell you how happy I was to find a line of marine care products that actually WORK! I was skeptical at first, but after putting Marine 31’s compounds and polishes to the test, I was sold! And the carnauba wax + sealant…WHOA! Excellent line of products! I’m located in Florida, so the super fast shipping (1 day!) was a nice surprise! Overall I couldn’t be happier with the products or services found at Marine31.com. Marine 31 Stainless Steel Polish & Sealant Combo Free Bonus! Marine 31 Select Trio – Your Choice!